In my previous articles i have given the tutorials about different unix commands, In this article i will try to give you the Difference Between Unix and Linux with multiple examples.Everyone has question in to mind that the commands of Linux and unix are almost same but what exactly the difference between unix and Linux ? This article gives you difference between unix and linux with examples. The unix is developed in AT & T bell’s laboratory by Dennis Ritchie and Ken Thomson. The first version of Unix is released in 1970. In 1991, while studying computer science at University of Helsinki, Linus Torvalds began a project that later became the Linux kernel.This is open source free operating system which is called as Linux. Linux is developed by Open Source development i.e. through sharing and collaboration of code and features through forums etc and it is distributed by various vendors. Unix is manufactured by big giant companies like oracle,IBM,AIX,HP. They have taken their own licencing for Unix Operating System. Linux kernel is developed by the community.Linus Torvald is behind the development of Linux operating system. It is just developed by Linus Torvald with his development community. Some free for development use (Solaris) but support is available for a price. Free but support is available for a price. OS X, Solaris, All Linux operating systems are best examples of Unix Operating system. Ubuntu,Fedora,Red Hat are best examples of Linux Operating System. Unix is based on Command line so that it is called as command line operating system. But for simplicity purpose the GUI (Graphical User Interface) has been created by developers and it is called as Common Desktop Environment. Linux is GUI(Graphical User Interface) based operating system. The linux mainly provides the KDE and GNOME GUI interface. As it is developed by set of developers from the world there are lot of alternative Graphical User Interfaces also. Unix can support the jfs, gpfs, hfs, hfs+, ufs, xfs, zfs file formats. Linux can support the Ext2, Ext3, Ext4, Jfs, ReiserFS, Xfs, Btrfs, FAT, FAT 32 ,NTFS file formats. Unix is not called as fully open source operating system as its code is not available freely.Unix is an operating system that is very popular in universities, companies, big enterprises etc. Linux is an example of Open Source software development and Free Operating System (OS). These are above some points where user can check Difference Between Unix and Linux . In following section i will try to give the Difference Between Unix and Linux in tabular format so that users will understand the points step by step. The UNIX is not freeware. The source code of UNIX is not available free for users. The Linux is freeware. The source code of Linux is freely available to all users. The UNIX uses different commands for performing the different operations. It is called as Command Line Operating System. Linux primarily uses Graphical User Interface (GUI) for performing the different operations. Linux uses command line interface as optional to perform operations. UNIX is non portable operating system Linux is portable operating system which can be executed on different hard drives. UNIX Operating system has rigid environment of hardware. It can not be installed on any hardware machine as it has some specific hardware requirements. Linux is very flexible operating system which can be installed on most of home based PCs. Unix is mainly used in most of server systems, High end computers and mainframe systems. Linux is used on home based pcs, desktops, mobile phones etc. UNIX is developed by AT & T programmers. Linux is developed by Active linux community Worldwide. Different versions of UNIX are AIS,HP-UX,BSD,IRIS etc.. Different versions of Linux are ubuntu, red hat, Solaris etc. Unix installation and using UNIX is costly operation as it needs high end hardware system Linux installation is not costly operation. It has not needed the high end hardware. The file systems supported by Unix are as follows: zfs, js, hfx, gps, xfs, vxfs. The file systems supported by Linux are as follows: xfs, ramfs, nfs, vfat, cramfsm, ext3, ext4, ext2, ext1, ufs, autofs, devpts, ntfs. 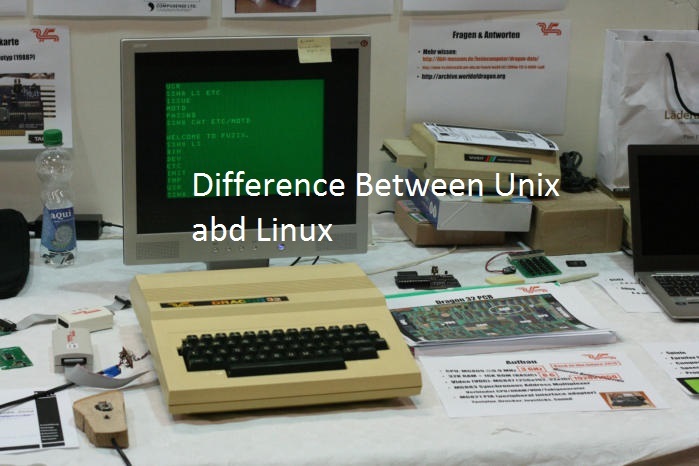 Hope you like this article on Difference between unix and linux. If you like this article or if you have any concerns with the same kindly comment it in comment section.